Your pets fill your life with joy and happiness in ways that can't be measured. At Holistic Pet Club, we make it easy for you to return the favor. We are loaded with non-stop pet supplies for your dog or cat. Eating: It is important to fill your pets with health and happiness. We offer high-quality, all natural Pet foods. Each of the companies we recommend stands behind their food 100% and we offer a money-back guarantee on any food you purchase. If you are unhappy for any reason we'll take it back and find you something new or give you back your money. Our expert staff can help you find the perfect items that meet your pets' needs and we are happy to Special Order any items you don't see! Playing: Kittens and puppies and dogs and cats need to play so it is important to provide them an outlet. We have a lot of toys here at Holistic Pet! Tough toys, squeaky toys, pull toys, chase toys...you name it we have a toy for every occasion. For cats we have laser pointers, cat-nip toys and all sorts of feathered fun items. For dogs, we have plush toys, felted-wool toys, hard rubber, soft rubber, rope toys and others. We offer brands like West Paw, Kong, Chuck-it, Zippy Paws, Multipet, Outward Hound, Starmark, go dog and many others. Many toy options are made right here in the USA! Dressing: People use clothes to show off their personality, why shouldn't your pet? Whether he's tough, flirtatious, smart or sassy, have your pet dress the part. Browse through our collection of jackets and fleece as well as designer collars and fun leashes to find that look for your pet. Bedding: Pets spend between half and two-thirds of their lives sleeping! It's important to have a good bed. Beds should provide a comfortable, cozy, soft and warm place they can curl up for those hours of "beauty sleep". We carry several styles of beds, cots and caves! We can also special order most anything you can find! Grooming: Regular grooming for your dog doesn't just keep them pretty; it keeps them healthy and happy. Grooming maintains a healthy coat and skin. Regular nail trims helps reinforce healthy foot structure and posture. With grooming, your pet will look and smell great and a healthy and properly brushed coat will shed less. 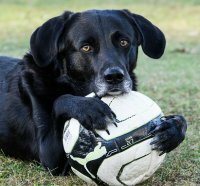 At Holistic Pet, we offer your dog a safe, stress-free experience. 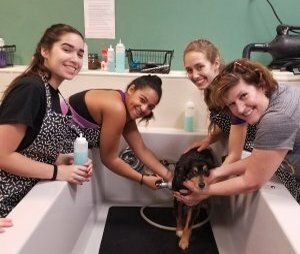 Our trained groomers are very attentive to each individual dog's needs and give them a unique one-on-one experience. Because of our attentive style appointments go fast so call for more information and to book an appointment 503-626-7387. 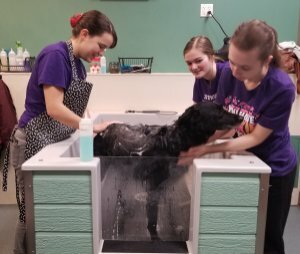 If you're not ready for a Professional Groom but your pet needs a bath, we offer a self-serve dog wash. We have 3 bays complete with shampoo, combs. brushes, ear cleaner and cotton balls, dog treats, air dryers, towels, and guest aprons. Everything you need except you and your dog! Have a cat that needs a bath...we recommend calling first to discuss an appropriate time! 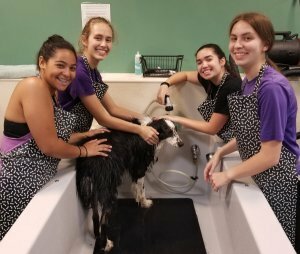 The dog wash is open 7 days a week at $15 per pet and closes 30 minutes before the store every day. Dog nail trimming is also available for $10, we have limited hours for this service, so please call ahead.